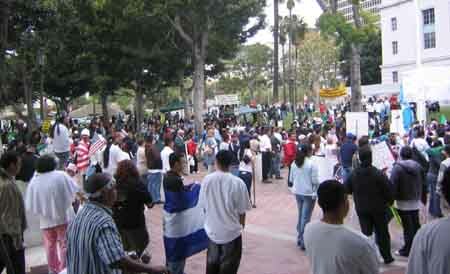 I went to the immigration protest today in downtown Los Angeles. I posted pictures here. I arrived late, missing the march but making it to the rally at city hall. It was another great showing of peaceful citizens demanding respect for their opinions. I’d say there were about 3,000 people at the rally when I got there, which is usually less crowded than the actual march. A lot of the speeches were in Spanish, which as a typical American, I couldn’t understand. You ever hear this one? What do you call someone who speaks 3 languages? Trilingual. What do you call someone who speaks 2 languages? Bilingual. What do you call someone who speaks 1 language? American. Here’s to making sure immigrants and the people that help them aren’t made felons – hell no to H.R. 4437. I would like to summarize a thought put forward by Noam Chomsky recently that I think is highly relevant today. When watching or reading non-Iraqi people debate whether or not America should withdraw, consider his words. When asked whether or not the U.S. should withdraw from Iraq immediately, Chomsky said that invading armies have no rights whatsoever. In fact, they have two responsibilities: (1) heed the will of the victims of the war (2) pay war reparations. And so in terms of withdrawal, his answer is that his opinion does not matter, so long as the Iraqi people want America out, as they overwhelmingly do. The reporter then asked him what about the concern that Iraq will turn into chaos and civil war. Chomsky replied that Germany could have said the same about France during WWII (and that in fact when the Germans pulled out of France, perhaps 10,000 people were killed as collaborators), and Japan could have said the same about the Asian countries it occupied, and the Soviet Union about the Russian satellite countries it occupied. I just wanted to put this point on the blog for the record because daily I hear these debates between presumably well-meaning people, about how the U.S. has a responsibility to stay in Iraq. I strongly agree with Chomsky’s assertion that the U.S. has a responsibility to adhere to what the victims want from us. Coincidentally, isn’t that how democracy works anyway?